In the last days of December, we talked about the update to Android Nougat for the Moto X Style. 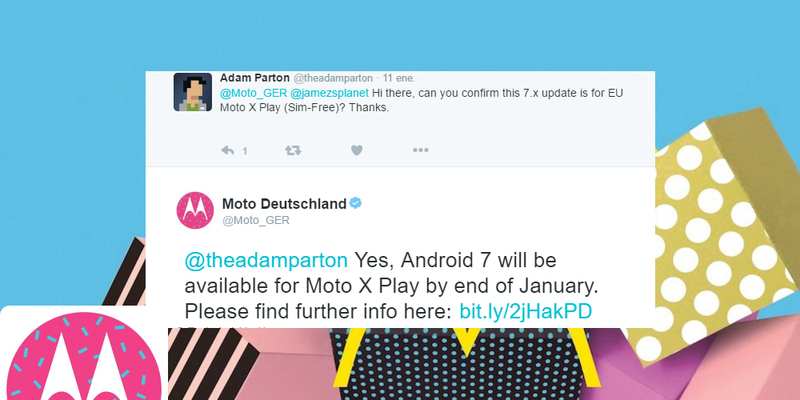 Well, the Moto X Play, the version developed by Motorola in collaboration with Google, is now news thanks to a tweet published by the official account of Motorola Germany. This news had been on the air for some time, when a presumed new Moto X Play with Android 7.1 Nougat on board was announced, something that the company did not confirm or deny at that time. However, today the thing is quite different, since the information comes from an official channel, so we speak of a very important confirmation. In theory, and if everything goes according to plan, Android Nougat will arrive at the end of the month of January to several Moto X Play. As for the firmware version deployed, the tweet was not very clear and did not explain if the version that will receive the device will be 7.0 or 7.1.1. Taking into account the moment in which the testing phase of this device began, it is possible that it is the last version used. The Lenovo Moto Z and the Lenovo Moto G4 have already received the update for Android 7.0 Nougat, but Motorola is still in its race against time, working on timely updates with Lenovo, whose smartphones are also pending, in most cases, to receive the latest version of Android available. The update in question would start with the unbranded or unlocked variant of the device, which is not linked to any telephone operator. At the moment we do not know what release date will have the update, but we will keep you informed as soon as we know.